« Warriors Score Last in See Saw Battle to Win! Colome football team remains undefeated with a 52-0 victory over Scotland on Friday. Michael Supik opened the scoring on a 66 yard run and followed it with a 37 yard TD run and Colome was up 14-0. In the second quarter, Jackson Kinzer completed an 11 yard pass to Layton Thieman for a touchdown. At the start of the third quarter, Kinzer connected with Thieman on a 59 yard touchdown. Beau Bertram scored on a 13 yard run, Riley Shippy on a 45 yard run and A. J. Davis on an 8 yard run. The Cowboys had 384 yards of total offense and held Scotland to 87 yards. In passing, Kinzer was 5-6 for 126 yards. Supik was the leading rusher with 148 yards. Shippy had 48 yards. Leading the defense was Wyatt Cahoy with 11 tackles followed by Bertram and Dawson Varilek with 8 each, Kinzer, 7 and Thieman, 6. 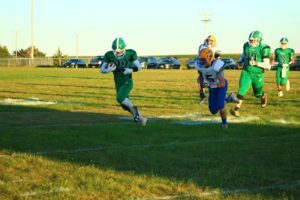 The Cowboys will travel to Corsica-Stickney on Friday, Oct. 5.